Who would have thought that an event like 7QP could be put together in less than nine months? Congrats to the individual state captains and lieutenants and Chairman K5RC. 280 logs were submitted by the June 10 deadline and six have trickled in since. In addition to a tabulation of the scores, K2DI has put together a very complete report on the statistics of the event -- counties activated, number of different calls logged, etc. 209 of the 259 7th-area counties were active. When you consider that this includes some of the most sparsely-populated areas of the US (8% of the population and 22% of the land area), it is a considerable achievement. Congratulations to the single-operator class winners W0BH, K6XV and K5UV in the Outside W7 group. Inside W7, K7L (K6LL), K7NJ and K7TQ were the single op champs. W6YX easily won the outside-W7 multi-op class, while K7ZSD near Portland OR walked away with the inside-W7 honors, followed by the NK7U group at the other end of the state in rare Baker County. There were many mobile operations, helped by the fact that we share the weekend with the MARAC CW event. K8RD had the high mobile score from outside W7 and K7BG cleaned up from Montana with a masterful display. Special recognition goes to the group of stations and operators who ran K7UGA as a commemorative effort on all bands and modes, creating a new unofficial "multi-multi-multi" entry class. We have another entry class called "county expedition". This is usually a Field Day type of operation, fixed portable, and the team of K7ZZ and W7UG clearly had their act together, winning by more than a 3dB margin. The rules promote operating on county lines by providing additional multipliers (equal to the number of counties) and it seems the resulting longer exchange was not a hindrance. For a first-time running of the event, things went very smoothly. There will be some rule changes for next year. W7s will be able to count DX multipliers. This should make it easier for the county hunters in Europe to break through the domestic QRM. There have been suggestions made to increase the length of the 7QP. This will cover more of the weekend with a night break so that mobiles can do an "out and back" with an overnight stay on the route. The jury is still out on this one and we welcome your suggestions. We share this first weekend in May with several other events -- The New England and Indiana QSO parties, the MARAC CW contest and the ARI DX contest. It is impossible to find a weekend without some other competing events so we have tried to make our exchange and rules as compatible with them as possible. It was interesting to note that many of the 7QP entries also show up in the results of the other contests. This was the desired result. Sponsored by the Central Oregon DX Club (and others). 1300 UTC Saturday to 0700 UTC Sunday (6 AM to midnight PDT the first Saturday in May). 7th call area stations work everyone, others work 7th area stations only. Work stations once per band/mode. 7th area mobiles (and those participating in other concurrent QSO parties or contests) may be worked again as they enter new counties. No repeater QSOs. Exchange: 7th area stations send signal report plus 5-letter county/state code (e.g. ORDES; see list). County-line stations send multiple codes (state code needed only once, e.g. ORDES/JEF). All others send signal report plus state/province/DX (stations in other QSO parties send their appropriate exchange). "Provinces" are VE1-9, VO and VY0-2. Scoring: 2 points per SSB QSO, 3 points per CW QSO. County-line contacts count as multiple QSOs for both stations. 7th area stations multiply QSO points by states (50) plus provinces (13). Others multiply QSO points by 7th area counties worked (259). Entry classifications: Single-op (high-power, low-power <150W, QRP <5W), multi-op, county expedition, and mobile. Certificates will be awarded to the top ten finishers in each category within and outside the 7th call area, plus the top finisher in each state/province. Bands: 160, 80, 40, 20, 15, 10, 6 and 2m, simplex only. Suggested operating frequencies: 40 kHz up on CW -- 3855, 7235, 14255, 21355 and 28455 on SSB. Logs: Send computer logs by June 10 to 7qplogs@codxc.org -- Cabrillo preferred, but any plain text format will be accepted. Be sure to include station callsign, entry classification, location code(s) and operator callsigns. Send paper logs to 7th Call Area QSO Party, c/o CODXC, 61255 Ferguson Rd, Bend, OR 97702. Please download and fill out a Summary Sheet if sending a paper log. Exchange: 7th area stations send signal report plus 5-letter county/state code (e.g. ORDES; see list). County-line stations send multiple codes (state code needed only once, e.g. ORDES/JEF). Non-7th-area stations send signal report plus state/province/"DX" (stations in other QSO parties send their appropriate exchange). "Provinces" are VE1-9, VO and VY0-2. County-line contacts may be logged with one entry showing all counties or one QSO entry for each county. Scoring: 2 points per SSB QSO, 3 points per CW QSO. County-line contacts count as multiple QSOs for both stations. 7th area stations multiply QSO points by states (50) plus provinces (13) plus other DXCC entities (maximum 10). Non-7th-area stations multiply QSO points by 7th area counties worked (259). Entry categories: Single-op (high-power, low-power <150W, QRP <5W), multi-op (including assisted single-op), 7th area county expedition, and mobile. Certificates will be awarded to the top ten finishers in each category within and outside the 7th call area, plus the top finisher in each state/province and 7th area county. Bands: 160, 80, 40, 20, 15, 10, 6 and 2m, simplex only. Suggested operating frequencies: 40 kHz up on CW; 1815, 3855, 7235, 14255, 21355 and 28455 on SSB. Check 80m at 0500Z, 160m at 0530Z. Logs: All logs must be received by June 10; those containing more than 40 QSOs must be submitted electronically via email or floppy disk. Send email logs to 7qplogs@codxc.org -- include the station callsign in the email "Subject" line. Cabrillo preferred (7QP details here), but any plain text format will be accepted. Be sure to include name and address and/or email address, station callsign, entry category, location code(s) and operator callsigns. Send paper logs to 7th Call Area QSO Party, c/o CODXC, 61255 Ferguson Rd, Bend, OR 97702. Please download and fill out a Summary Sheet if sending a paper log. Check to make sure your callsign appears on our website's Logs Received page (normally within two days of receipt). 1300 UTC Saturday to 0700 UTC Sunday (6 AM to midnight PDT the first Saturday in May). 7th call area stations work everyone, others work 7th area stations only. Work stations once per band/mode. 7th area mobiles (and those participating in other concurrent QSO parties or contests) may be worked again as they enter new counties. Awards: Certificates will be awarded to the top three finishers in each category within and outside the 7th call area, plus the top finisher in each state/province and 7th area county; a 25-QSO minimum applies. Exchange: 7th area stations send signal report plus 5-letter state/county code (e.g. ORDES; see list). County-line stations send multiple codes (state code needed only once, e.g. ORDES/JEF). Non-7th-area stations send signal report plus state/province/"DX" two-letter codes. Stations in other QSO parties send their appropriate exchange. "Provinces" are VE1-9, VO and VY0-2. County-line contacts may be logged with one entry showing all counties or with one QSO entry for each county. Bands: 160, 80, 40, 20, 15, 10, 6 and 2m, simplex only. Suggested operating frequencies: 1815 and 40 kHz up on CW; 1845, 3855, 7235, 14255, 21355 and 28455 on SSB. Check 80m at 0500Z, 160m at 0530Z. All CW contacts must be made in the CW portion of the band. Logs: All logs must be received by June 5; logs containing more than 40 QSOs must be submitted electronically via email or floppy disk. Send logs to 7qplogs@codxc.org -- include the station callsign in the email "Subject" line. Cabrillo preferred (7QP details here) but any plain text format will be accepted. A web form is available for online Cabrillo log-file generation and submission. Be sure your entry includes name and address and/or email address, station callsign, entry category, location code(s) and operator callsigns. Send paper logs with a completed summary sheet to 7th Call Area QSO Party, c/o CODXC, 61255 Ferguson Rd, Bend, OR 97702. Check to make sure your callsign appears on our web site's Received Logs page (normally within two days of receipt). Other: All equipment and antennas must lie within a 1000-foot diameter circle. A county expedition is an operation from a temporary location using antennas installed for the contest period, using temporary antenna supports or trees. Mobile stations must be self-contained and capable of motion. 1300 UTC Saturday to 0700 UTC Sunday (6 AM to midnight PDT the first Saturday in May). 7th call area stations work everyone, others work 7th area stations only. Work stations once per band/mode. 7th area mobiles (and those participating in other concurrent QSO parties or contests) may be worked again as they enter new counties. Rule changes are shown in bold italic. Exchange: 7th area stations send signal report plus 5-letter state/county code (e.g. ORDES; see list). County-line stations send multiple codes, e.g. UTRIC/IDBEA (state code needed only once, e.g. ORDES/JEF). Non-7th-area stations send signal report plus state/province/"DX" two-letter codes. Stations in other QSO parties send their appropriate exchange. "Provinces" are VE1-9, VO and VY0-2. County-line contacts may be logged with one entry showing all counties or with one QSO entry for each county. Bands: 160, 80, 40, 20, 15, 10, 6 and 2m, simplex only. Suggested operating frequencies: 1815 and 40 kHz up on CW, except on 40m, where 7025-7035 is suggested; 1845, 3855, 7180, 14255, 21355 and 28455 on SSB; 3580+, 7035+, 14070+, 21070+ on PSK; 3585+, 7038+, 14075+, 21075+ on RTTY. Check 80m at 0500Z, 160m at 0530Z. All CW and Digital contacts must be in the CW/Data sub-bands. Scoring: 2 points per SSB QSO, 3 points per CW or Digital QSO. County-line contacts count as multiple QSOs for both stations. 7th area stations multiply QSO points by states (50) plus provinces (13) plus other DXCC entities (maximum 10). 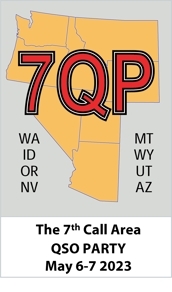 Non-7th-area stations multiply QSO points by 7th area counties worked (259). Other: All equipment and antennas must lie within a 1000-foot diameter circle. A county expedition is an operation from a temporary location using antennas installed for the contest period, using temporary antenna supports or trees. Mobile stations must be self-contained and capable of motion. Any computer-to-computer mode is considered digital. The same station may be worked on each band on CW, Phone, and Digital. All contacts must be made without using repeaters, digipeaters, satellites, etc. Exchange: 7th area stations send signal report plus 5-letter state/county code (e.g. ORDES; see list). County-line stations send multiple codes, e.g. UTRIC/IDBEA (state code needed only once, e.g. ORDES/JEF). Non-7th-area stations send signal report plus state/province/"DX" two-letter codes. Stations in other QSO parties send their appropriate exchange. The 13 "Provinces" are VE1-9, VO and VY0-2. County-line contacts may be logged with one entry showing all counties or with separate entries for each county. Logs: All logs must be received by June 5; logs containing more than 40 QSOs must be submitted electronically via email or floppy disk. Send logs to 7qplogs@codxc.org -- include the station callsign in the email "Subject" line. Cabrillo preferred (7QP details here) but any plain text format will be accepted. A web form is available for online Cabrillo log-file generation and submission. Be sure your entry includes name, address and/or email address, station callsign, entry category, location code(s) and operator callsigns (if Cabrillo, they should appear within the Cabrillo file itself). Send paper logs with a completed summary sheet to 7th Call Area QSO Party, c/o CODXC, 61255 Ferguson Rd, Bend, OR 97702. Check to make sure your callsign, with correct entry category, appears on our web site's Received Logs page -- normally within two days of receipt. Logs: All logs must be received by June 5; logs containing more than 40 QSOs must be submitted electronically via email or floppy disk. Send logs to 7qplogs@codxc.org -- include the station callsign in the email "Subject" line. Cabrillo preferred (7QP details here) but any plain text format will be accepted. A web form is available for online Cabrillo log-file generation and submission. Be sure your entry includes name, address and/or email address, station callsign, entry category, location code(s) and operator callsigns (if Cabrillo, they should appear within the Cabrillo attachment itself; the log processor ignores the rest of the message). Send paper logs with a completed summary sheet to 7th Call Area QSO Party, c/o CODXC, 61255 Ferguson Rd, Bend, OR 97702. Check to make sure your callsign, with correct entry category, appears on our web site's Received Logs page -- normally within two days of receipt.